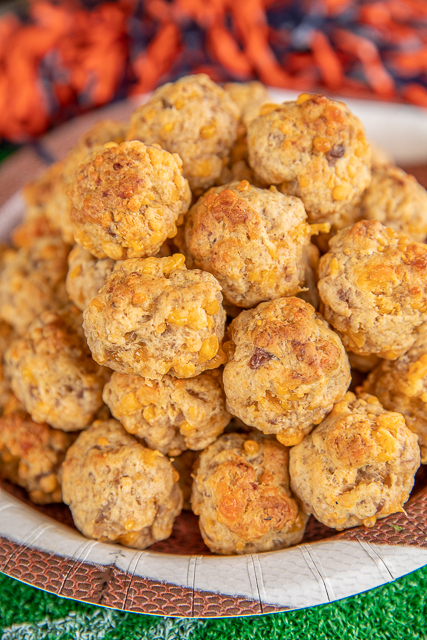 Sausage Pancake Bites - perfect for breakfast, lunch, dinner or parties! Can make in advance and freeze unbaked for later. Only 4 ingredients - sausage, cheese, maple syrup, and pancake mix. Mix in your KitchenAid stand mixer and they come together in minutes. Serve with syrup and hot sauce. My college team has their spring practice game this week, so I've got tailgating on my mind! 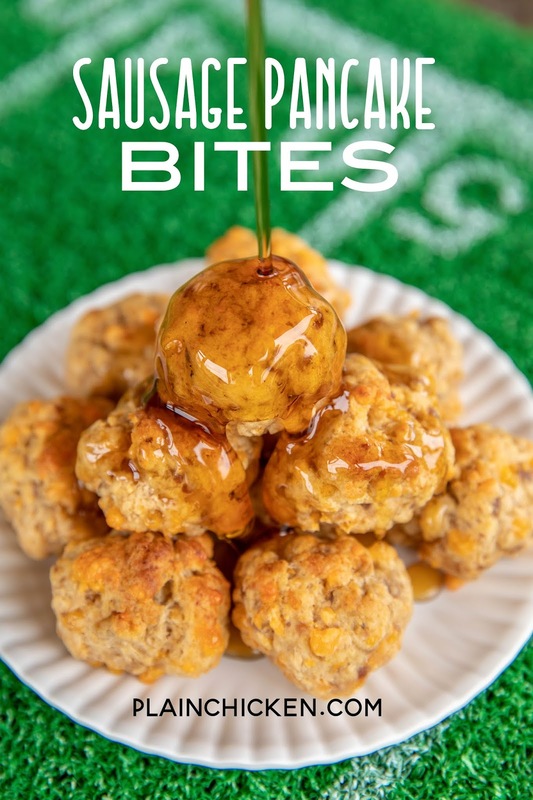 I plan on whipping up a batch of these yummy Sausage Pancake Bites. I love them! Sausage, cheese, maple syrup, and sweet pancake mix. YUM! They are great for breakfast, brunch, lunch, dinner, and parties. I used a roll of breakfast sausage for this recipe. I usually use Jimmy Dean or Tennessee Pride brand. You can use regular or hot sausage - either works great. Heck, double the recipe and use one of each. You can even use turkey sausage if you prefer. Can these Sausage Pancake Balls be Frozen? 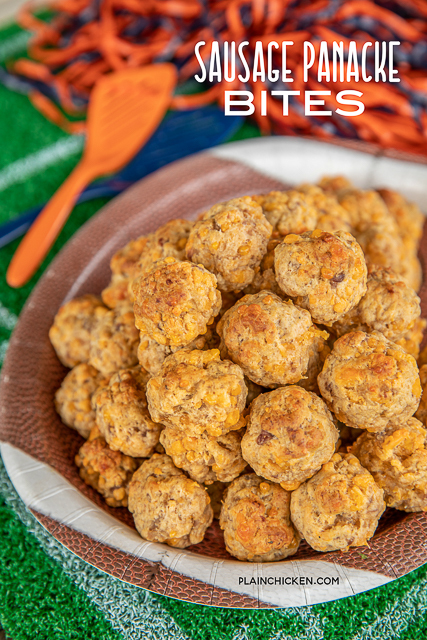 My favorite thing about this recipe is that you can make these Sausage Pancake Bites ahead of time and freeze them unbaked for a quick breakfast or snack later. Just add a couple of minutes to the cooking time if baking them frozen. I freeze the Sausage Pancake Bites on a baking sheet and then transfer them to a freezer ziplock bag once they are completely frozen. As I said, this recipe uses pancake mix. This is what I used. 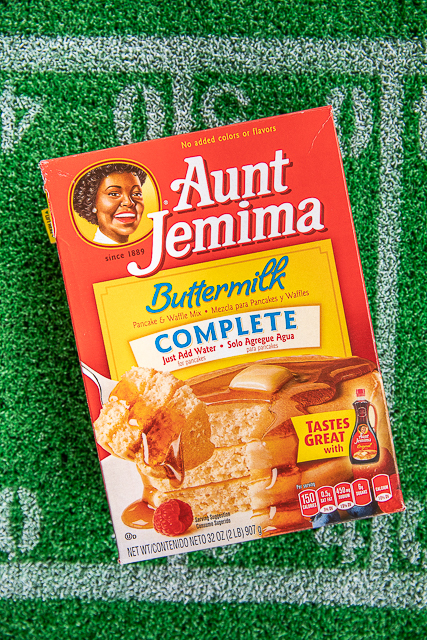 Pancake mix is a little different from Bisquick. One difference is that it is a little sweeter. 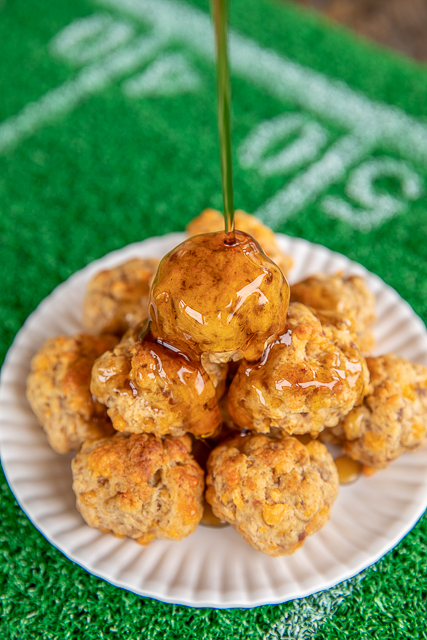 It gives these Sausage Pancake Bites the perfect amount of sweetness. Not too much; just enough. My number one tip for making these Sausage Pancake Bites is to mix everything using your KitchenAid Stand Mixer. It is PERFECT! Just attach the dough hook and place all the ingredients in the bowl of the mixer. Turn the mixer on low and it will do all the mixing for you. No more gross sausage hands! These Sausage Pancake Bites taste great hot or at room temperature. Chicken Legs prefers them drenched in syrup. YUM! I like to mix a little hot sauce with the maple syrup and dip the sausage balls into that. Sweet & spicy in every bite. Go ahead and whip up a batch and pop them in the freezer. They make a great weekday breakfast! Place all ingredients in the bowl of KitchenAid stand mixer fitted with a dough hook, Mix on low until thoroughly combined. Shape sausage mixture into balls. Place on a rimmed baking sheet. 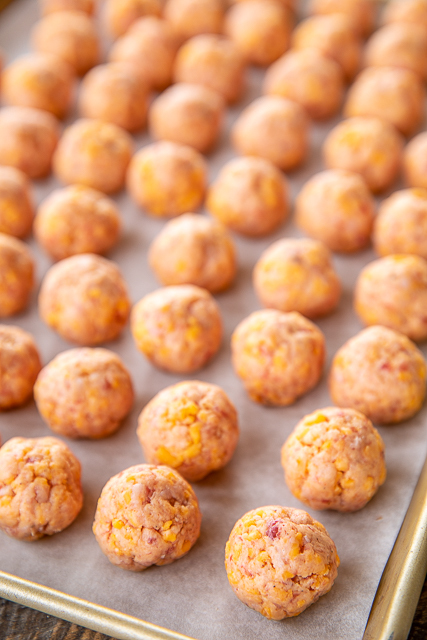 After shaping the sausage mixture into ball, you can freeze them unbaked. If baking from frozen, add a few minutes to the baking time. SOUNDS DELISH!!!! can't wait to make some and try them in the air fryer!